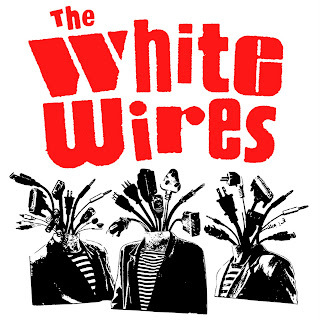 The White Wires - Self Titled LP (DMR 033). What a sigh of relief these are finally here. If you're still in the dark on this one, The White Wires are a three piece from Ottawa. This LP was originally released by Going Gaga Records on Novemer 8, 2008 in a quantity of 325 copies. Those of you lucky enough to score a copy before it went out of print were well aware of how urgently this record needed to be available again, and we are flattered to be the people responsible for that. It's a perfect summer time record yet it is just in time for the holiday season for the second consecutive year. The White Wires have found a harmonious balance somewhere between the lands of goofy and cool, and their songs reflect that brilliantly. This LP features nine songs of maximum sing-a-long-ability without a trace of pretense. A couple of listens and you'll be planning imaginary BBQ's with The White Wires as your entertainment and guests of honor. 100 are on limited edition red vinyl, so buy them up before the November 3rd release date. This album is also available for download pretty much anywhere that you can download music.